Click on the Name of the Fort to see the picture. 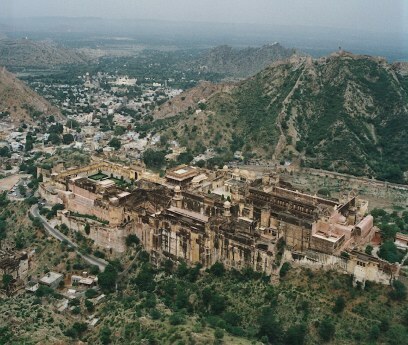 There are three forts in Jaipur: Amber Fort, Jaigarh and Narhargarh. Each fort had there own special use. Amber Fort was used not only as a defence system from intruders but also served as main residence for the Kachawas rulers. 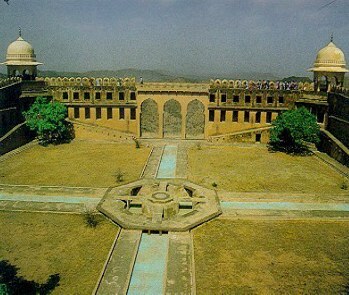 Jaigarh was mainly used as a defence system against invaders and also held the famous Kachawas treasury. Naharagarh was mostly used as a residence by the Kachawas rulers, especially by the Maharanis during the hot summer months. 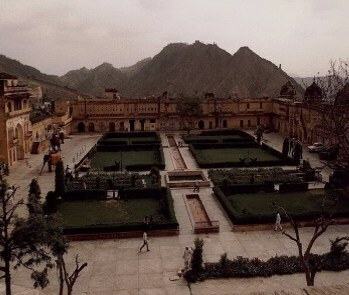 Naharagarh is located on a mountain top behind the City Palace of Jaipur. 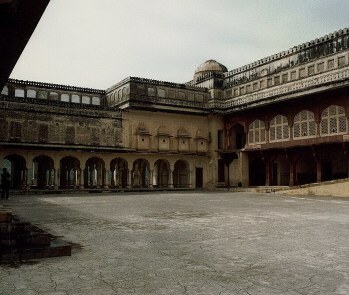 It is said that there was a secret passage between the Naharagarh and the City Palace so in case of attacks the maharaja and the royal family could escape to the fort. Suraj Pol (Sun Gate): The royal entrance to Amber is on the eastern part of the fort facing the sun symbolizing the belief that the Kachawas Rajputs descended from the sun. Amber Fort as seen from above. 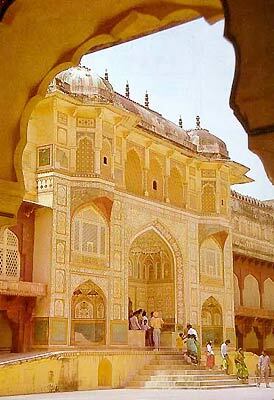 Copyright© of the photograph of Amber Fort above is property of THE SHUNYA. All rights reserved. 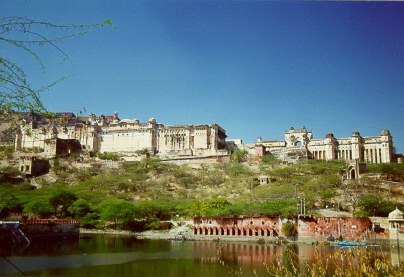 Amber Fort of Jaipur: By the time Maharani Gayatri Devi came to Jaipur, the fort was no longer used by the royal family. 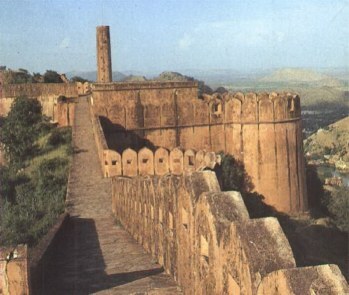 This fort was served as Jaipur's former capital and today remains a reminder of Jaipur's past glory. 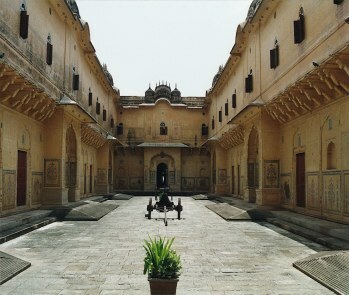 Jaleb Chowk is part of the Raj Mahal in Amber Fort. This is accessed through the Suraj Pol. The gateway on the left is the Chand Pol (Moon Gate), and next to the gate is the elephant station. Jaleb Chowk of the Raj Mahal in Amber Fort. 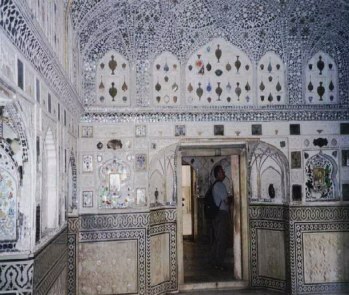 Sheesh Mahal (Palace of Mirrors) of Amber. 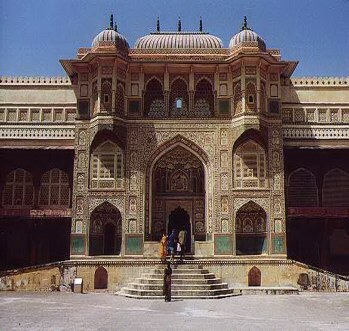 This is one of two Sheesh Mahals in Amber Fort. It is said that the entire room can be illuminated with a single match or candle. Jaigarh (Victory Fort) Jaigarh Fort was used mainly to defend Amber from invaders and also contained the Treasury of Kachawas Rajputs which the Mina tribesman protected. 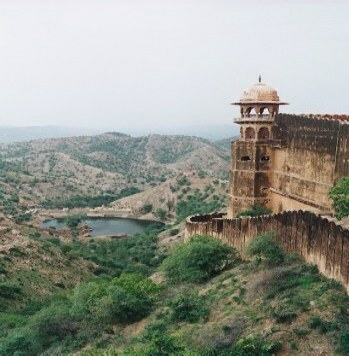 Jaigarh Fort is one of the few forts in India which stands completely intact. It is known for its extensive walls, watch towers, and many bastions. During the Emegency declared by Shrimati Indira Gandhi, Prime Minister of India, excavations were made in Jaigarh Fort to find any hidden treasures. However, the excavations were unsuccessful, but signs of the excavations are still visible today. 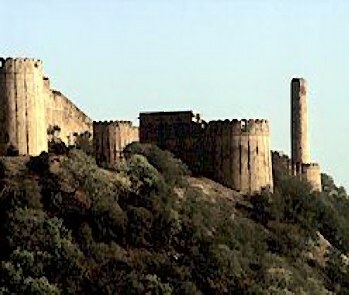 Jaigarh Fort: The right is one of the many watch towers of Jaigarh. Copyright© of the photograph of above of Jaigarh Fort is property of THE SHUNYA. All rights reserved. The Mughal Gardens of Jaigarh Fort. Divided in four parts by the four channels and the grand fountain at the center. Jaivan (Victory Canon) is found in Jaigarh Fort. 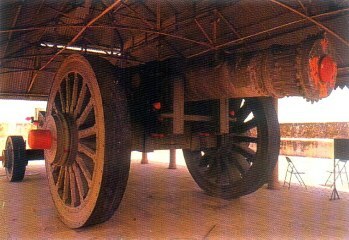 It is said to be largest moving canon in Asia. This canon was never used in war and was fired only once. The canon is still worshiped on day of the "Shastra Puja" (Worship of Arms) by the Maharaja of Jaipur. 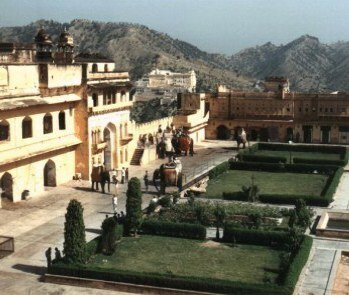 Naharagarh (Tiger Fort) is the third fort in Jaipur, and at one point was used as a summer residence by the rulers of Amber and Jaipur. 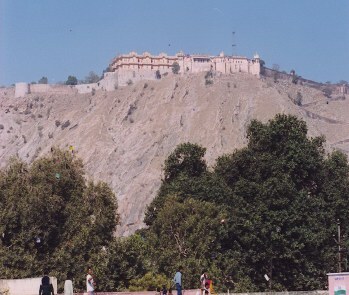 Copyright© of the photograph of above of Nahargarh Fort is property of THE SHUNYA. All rights reserved.